Dealing with hair loss? By now you’ve probably gone through a whole host of treatments to spur regrowth. That said, have you considered low level lasers therapy (LLLT)? Yeah, sure — lasers sound a little too science fiction. In reality, though, LLLT is clinically proven to treat hair loss and boost hair regrowth. Researchers have been studying the possible medical application of lasers since the 1960s, and discovering its ability to treat hair loss was a happy accident. Clinical studies of laser hair loss therapy have shown promising results, especially for androgenetic alopecia. The good news is, nowadays, laser hair growth devices are easily accessible and affordable! Among number of hair loss laser devices on the market, we found that there are only 2 promising products worth looking at. But first let’s start with basic, what and why do you need laser hair growth treatment? 1 Laser hair growth device/treatment? 1.1 What is laser hair growth device/treatment? 1.2 How does laser hair growth treatment work? 1.3 What is the cost of laser hair therapy? 1.4 What are side effects of laser treatment/therapy for hair loss ? 2.1 Why do we choose iRestore laser hair growth system? 2.2 Does iRestore hair laser work? 2.3 What do real customers say? 2.5 How to use iRestore laser hair growth system? 3.1 What do real customers say? What is laser hair growth device/treatment? Here’s what you need to know about laser therapy: it’s a safe and efficient treatment that works to stop hair loss and encourage hair regrowth. It all started with a Hungarian doctor named Endre Mester. In the 1960s, Mester was doing a correlation study on lasers and cancer when he made an unexpected discovery. His low dose laser didn’t give the shaved lab rats cancer. Instead, he noticed significant hair regrowth on the rats’ bald areas! Since then, low level laser therapy (LLLT) has become a key treatment option for hair loss sufferers. See, LLLT uses red or near-infrared light to stimulate cell activity. In fact, it’s commonly used to repair tissue damage, heal wounds, and treat skin conditions. So how does this apply to hair loss? With the right wavelength, LLLT penetrates the scalp and stimulates the hair follicles to encourage regrowth. All laser hair growth devices in the market use LLLT, though there’s great variety in design. Most people are familiar with the overhead panel and the bonnet (head cap) versions. But hand-held laser hair growth devices are also quite popular these days, thanks to ease of use and portability. The comb format is a particular crowd favorite since it really works the laser light right through the strands. Laser hair growth devices use diodes that emit red light to combat hair loss and encourage hair regrowth. The standard wavelength is between 630 to 670 nanometers, otherwise the light won’t penetrate the scalp. This is important, because LTTT needs to get right to the hair follicles and stimulate the epidermal stem cells. By activating these stem cells, the laser light can kick off the anagen or growth phase of the hair cycle. Laser hair growth devices also extend the anagen phase, so hair can grow to its maximum potential. Bonus benefit: LLLT can prevent the build up of excess dihydrotestosterone (DHT) — the culprit behind pattern baldness. This makes laser hair growth devices the best option for fighting the most common cause of hair loss: androgenetic alopecia. There’s no one size fits all expense tab for laser hair growth treatments. Obviously, someone with just a bit of hair thinning won’t be in the same boat as someone with an already noticeable bald patch. Cost can vary depending on the individual, the diagnosis, and the number of treatments required. A laser therapy clinic will have you undergo two to three treatments per week — that’s over 70 sessions a year! Even affordable treatments can start to add up over time. That said, a more affordable — and certainly more popular — option is to get a laser hair growth device for home use. And the prices for these devices vary from less than 100 or up to 500 dollars. Don’t be scared by the number! Let’s imagine that, one day, your head is full of hair again and all you have to pay is just … couple of hundreds with zero risk. Why? You will find it just right now and more after. What are side effects of laser treatment/therapy for hair loss ? Laser light therapy is a common treatment not just for hair loss, but for a wide variety of ailments. It has been deemed safe for regular use and has no known adverse side effects on the body. Laser hair growth devices are painless and the heat from the diodes won’t hurt or burn your skin. Some users have reported telogen effluvium (TE) or excessive hair fall for the first two months after using a laser hair growth device, but this is temporary. Of course, safety tips are still recommended! Remember: don’t look straight at the red light emitted by the device, and always patch test if your skin is very sensitive. Consult a doctor if you’re on photosensitive medication. Congratulation, you have already finished 35% of the article. Keep going! iRestore laser hair growth system is an FDA-cleared treatment for hair loss. It is non-invasive, painless, and designed for hands-free home use. Unlike the usual treatment options, this laser hair growth device is completely drug-free and won’t have any side effects. The device can be used by both men and women. It is highly recommended for hair loss sufferers with androgenetic alopecia (pattern hair loss) and telogen effluvium. The iRestore laser hair growth device uses laser light with 650 nanometers — the optimum wavelength to penetrate the scalp and stimulate the hair follicles. 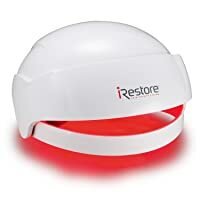 With 51 laser lights from the helmet, the iRestore stops the follicles from shrinking. This means the follicles can pursue the full hair growth cycle and get hair to grow to its maximum length without breaking or shedding. The helmet itself is comfortable to wear and won’t impede the user’s regular activities. Although the iRestore can be used alone, you can maximize results by using it alongside other treatments like medication and shampoo. Users can see a decrease in hair shedding in just a few weeks, though regrowth can take 3 to 6 months. Do you remember that I mentioned about zero risk? And so here it is! iRestore offers a full money-back guarantee within 180 days of purchase. If you are not happy with the result, you get all your money back. Why do we choose iRestore laser hair growth system? So why do we recommend iRestore laser hair growth treatment to hair loss sufferers? The first and foremost important factor: iRestore is FDA cleared and safe to use with clinical proven result. It’s completely painless and can be used at home with no additional effort required. All you have to do is put on the helmet and let the treatment session run for 25 minutes. It’s hands-free and you can go about your day doing your regular chores. This laser hair growth device is non-invasive and has no adverse side effects. iRestore’s laser technology uses the perfect wavelength to penetrate the scalp and boost hair growth. LLLT through iRestore’s diode lights remove excess DHT build up and prevent hair follicles from shrinking to stop genetic hair loss. It also invigorates the follicles so hair can grow longer and stronger. You can see visible hair growth in 3 to 6 months, though some customers have reported positive results sooner. Otherwise, after 6 months using, you can return product for full refund. So, what to lose? Does iRestore hair laser work? A clinical study conducted in 2017 showed that 100% of the subjects saw hair regrowth with regular iRestore use! After just sixteen weeks, subjects saw 43.2% average hair growth. Of course, it’s important to remember that results can vary depending on individual circumstances. iRestore laser hair growth system boosts the hair growth cycle and prevents follicular miniaturiziation. The helmet not only stops excess hair fall and prevents further hair loss, it also strengthens hair strands to stop breakage. This home use laser hair growth device works best on hair loss caused by pattern baldness and telogen effluvium. What do real customers say? Users noticed less hair fall in just two to six weeks. Many of iRestore’s customers saw fewer hair strands left on their brushes or pillows in that short time frame. Some reviews noted temporary telogen effluvium or excessive hair fall in the first couple of months before seeing any improvements. Reports on hair regrowth are varied, with some users noticing peach fuzz in just 8 weeks. Other users saw thicker hair between 3 to 6 months of regular use. The helmet itself is easy to use and requires no additional work for the 25 minutes treatment session. However, some users felt that the helmet was a little too small for their heads. With the recommended 3 to 4 uses per week, a lot of customers found the process easy and painless, though some reported itchiness. Users also noticed thicker, stronger hair with less breakage. Testimonials for iRestore show customers with noticeable hair growth on bald patches, usually those caused by androgenetic alopecia. How to use iRestore laser hair growth system? To get the most out of iRestore, make sure to use it every other day on non-consecutive days. Each session runs for 25 minutes. All you have to do is put on the helmet and let the treatment session run its course. Don’t use it daily; excessive use of iRestore won’t speed up the hair growth process and might even have side effects. Make sure that hair is completely dry before using. For safety purposes, keep the iRestore laser hair growth device away from any wet areas. The iRestore can be used with other hair loss medication and treatments with no adverse effects. The Hairmax Prima 9 LaserComb is an FDA-cleared device for hair loss. LaserComb is clinically proven effective for stopping hair loss and excessive hair fall. It is completely safe and painless to use. This LLLT device has laser lights at 650 nanometers. This is the optimal wavelength for effectively penetrating the scalp. Hairmax Prima 9 LaserComb has 9 medical grade laser modules and specially designed teeth to maximize the laser light delivery to the follicles. The LaserComb stimulates the follicles to boost the anagen or growth phase of the hair growth cycle. It also revives dormant follicles, resulting in thicker volume with regular use. LaserComb fights DHT to prevent further hair loss caused by androgenetic alopecia. The device also helps repair damaged hair to stop breakage and help the strands grow to their full potential. The comb design makes it easy to target specific areas of the scalp, so you customers can either go over their whole head or just treat bald patches. The LaserComb is light and cordless so it’s easy to travel with. The device comes with a rechargeable battery. LaserComb can be used on its own with 11 minute treatment, but Hairmax offers a complete kit that comes with a shampoo and conditioner for holistic treatment. Hairmax offers a 5-month money-back guarantee with deduction of 20% of restocking fee. According to Hairmax studies, hair growth comes in around the 12th week mark. Customers with the early signs of pattern baldness, however, reported significant improvement in just two weeks! Some users noticed an increase in hair fall in the first two months of use, but soon noticed new hair growth in thinning areas. Customers also saw thicker and stronger hair strands with regular use of the Hairmax Lasercomb. The comb is easy to use but it does require the user to move the device every few seconds to cover the whole head, so it’s not as hands-free as a helmet. Some users found the beeping annoying, while others saw it as very helpful in ensuring that the whole head is properly treated. Congratulation, you have already finished 80% of the article. You are almost there. Keep going! 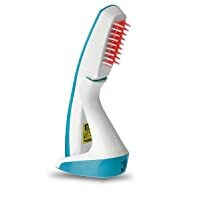 The Hairmax Lasercomb looks and works like a regular comb, except with laser lights for hair growth treatment. Following the beeps, slowly use the Lasercomb all over your head. For best results, make sure to use this laser hair growth device on a clean scalp. You can use the Lasercomb on damp hair, but never while your hair is still soaking wet. Use this LLLT device three times, 11 minutes each, a week on non-consecutive days. You can lessen the number of weekly treatments once you’ve achieved the results you want, but don’t stop completely as your hair loss will return. For best results, you can use Hairmax LaserComb with other hair loss treatments and shampoos. Q: Who can benefit from laser hair loss therapy? A: Anyone suffering from hair loss can benefit from LLLT, although it is most highly recommended to those with genetic hair loss (androgenetic alopecia). Q: Will I have to keep using the laser hair growth device forever? A: Excessive hair fall and thinning can return once you stop the treatment, so you’ll definitely have to continue using the device. You could lessen the number of treatments per week once you achieve the results you want, but don’t stop using the laser hair growth device fully. Q: Can I use a laser hair growth device with hair loss medication or shampoos? It’s completely safe to use LLLT devices with other hair loss treatments, and can even improve results. Check this link to find which one is the best Biotin shampoo. Q: Is LLLT safe to use for pregnant women? A: Please consult your attending doctor for proper guidance. Q: How old do I have to be to use a laser hair growth device? A: Most LLLT devices are for users 18 and above, so it’s best to speak to your doctor if you’re 17 or younger. Laser hair growth devices are proven effective, easy to use, and have no side effects. It’s true that there are many other hair loss treatment options out there, but LLLT devices are completely safe and won’t cause adverse reactions to users. You don’t even have to leave the house to get an FDA-cleared hair loss treatment — how’s that for convenience? Most importantly, clinical studies have proven that laser hair growth devices work. Majority of customer testimonials are positive, even though the timeframe for individual results can vary. Home laser devices for hair loss are also a lot more affordable than the regular treatments offered at clinics. If you’re dealing with hair loss, pick the best laser hair growth device and give it a try. I have tried many things for hair grow back but get no positive result. Home remedies and organic things are works for a few days. If you stop using them the result will be worse then before. Now I have decided to move on and tried nonnatural ways like laser technology. I hope I will not regret later. Nizoral Hair Loss Shampoo 2% ketoconazole: Stop Searching For It! Disclaimer: The information contained within this site is not intended as a substitute for professional medical advice. If you have, expect to have, or suspect you may have any medical condition, you are recommended to consult with a healthcare provider. These statements have not been evaluated by the Food and Drug Administration. These products are not intended to diagnose, treat, cure, or prevent any diseases or medical conditions. Results are based on HairlossTopia Ranking System and do not necessarily reflect typical results from the use of these products. Please visit product websites for more information. FTC Disclosure: We represent a professional research and review team, and on our page, you may find affiliate links for which we could be compensated for by clicking on them. http://HairlossTopia.com is a participant in the Amazon Services LLC Associates Program an affiliate advertising program designed to provide a means for sites to earn advertising fees by advertising and linking to amazon.com.